When we discuss the ins and outs of interior design here at homify, our tastes are typically attuned to the needs of the adult world. While this is all well and good, we mustn't forget about the kids. Sure, many of us might be living in one or two person apartments at present, but it's likely the case that we'll consider upgrading to a fully fledged family abode at some point, at which point we'll need to consider not just our own needs, but that of our current and impending children too. When I was a kid, there was one thing I always wanted in my home: a bedroom that functioned as a great play room, a cosy haven full of fun and intrigue, well designed and furnished with an excellent range of colours and vibrancy. Creating a great kids room can be a challenge: because they grow up so quickly, their tastes become very changeable. Versatility needs to accompany a sense of fun and warmth, while incorporating your children's own inherent tastes and preferences. Today on homify, we're catering to the kids with a look at how your can create a bedroom for your children that is not only beautiful and playful, but functional too. Take a wander through, bring out your inner child, and consider the best ways to create a safe, fun and exciting space for your children, current and future. While a thoughtful array and placement of artificial light can work wonders in the kid's room, having a great amount of natural light can make all the difference too. Fun and excitement work hand in hand with brightness and illumination, and light that a room receives from natural sources is a fabulous way to induce this. The room here is case in point: a lovely, warm and cosy room, replete with white floorboards and sturdy bed, bathed delightfully in natural light thanks to the addition of these feature windows with colonial-style shutters. One of the first rules when it comes to creating a fabulously fun and exciting children's bedroom is to work well with colour. Choosing a range of fabulous colours, working and blending them through your wall paint, furniture selection and accessories, is one of the easiest ways to induce a sense of effortless fun and delight. Here, we have a fabulous example of what's possible with a little imagination and a sense of design harmony. The first thing we notice is the excellent and eclectic palette of colours: a soft teal blue on the brickwork anchors the room perfectly, playing off against the raw white toned floorboards; the feature orange hanging wall lamp provides beautiful illumination next to the harmonious fox motif, accessorised elegantly with this cute and cosy purple bed, wavy rug, and fabulous tee pee with feature raincloud. You could say that this room is almost like a scene out of a fairytale or cartoon: enigmatic, bright and fabulously playful. While simple in some ways, working with colour in the kids' room can be a tricky task to get right. If you're having trouble choosing the right blend of colours and tones, why not have a chat to a professional to get you on the right track? 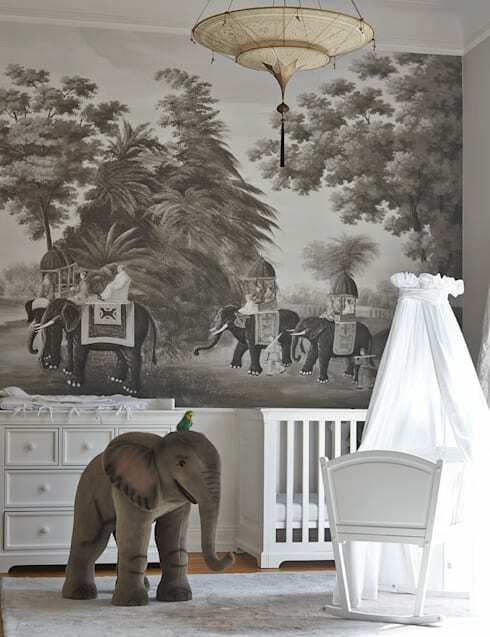 The second thing to consider when you're detailing your children's room is to accessorise, and accessorise well. Kids have a fabulous sense of imagination that really ought to be enhanced by the items and pieces they experience in their room each and every day. Here, we see how easy it is to create a fresh sense of fun and interest in an already well-appointed playroom and bedroom set up: a fantastic feature bear rug, performing fabulously as a toy, comfort piece and design statement. This is the sort of thing that your kids can't help but love. When it comes to any room in the house, a great choice of lighting, from the source to the placement and the design of the fittings, is a crucial element that ought to be considered. So too, when it comes to the kid's room, lighting can really make all the difference between a basic room, and one that really drives home a 'wow' factor. 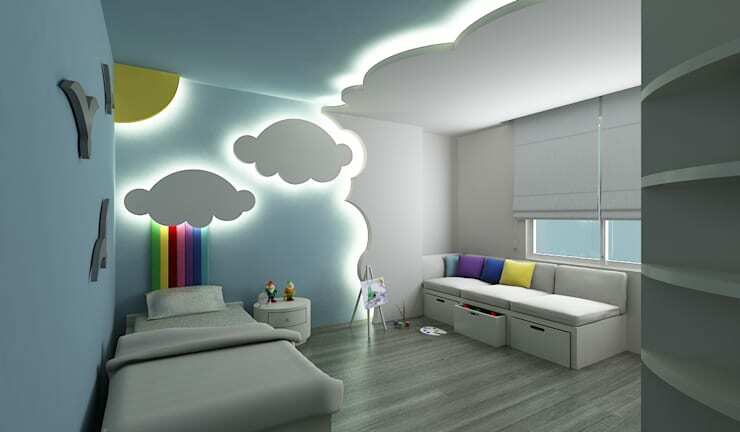 Take this fabulous kid's room as a starting point: something original, unique and fantastically out of the ordinary—a clever use of strip lighting behind cutaway cloud shapes that not only creates a great mood, sense of interest and imagination, but illuminates the space in a soft, warming manner, as well as sections off the room to create a sense of division: playroom in one half, sleeping area in the other. Very neat. 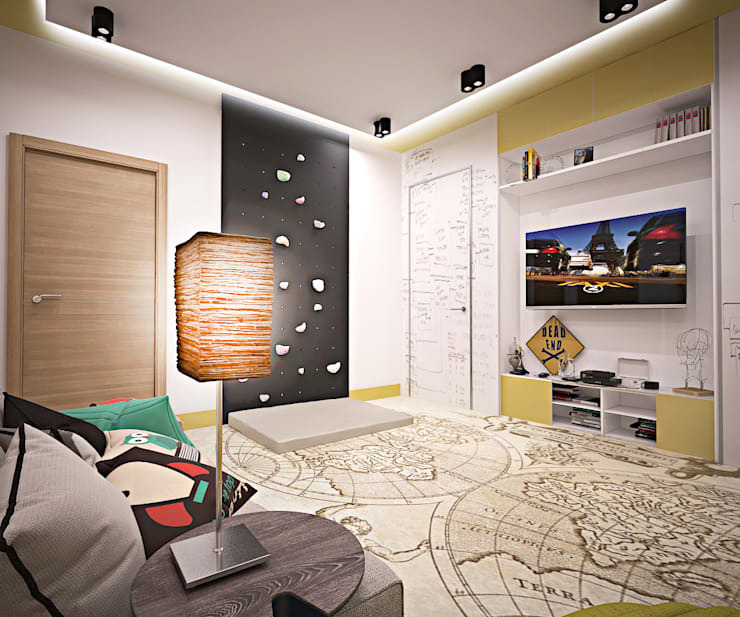 Working with your walls is another great way to create a sense of fun and beauty in the kid's room. If you're working with relatively plain, basic walls, you might do well to brighten them up with a great selection of wallpaper or wall tattoos. These days, there are so many fabulous wallpaper designs for both kids and adults alike. This example is an an excellent one: a well thought out colonial elephant motif, graceful in black and white, lacking nothing despite its use of basic tones, and working marvellously with feature elephant toy in the foreground. If nothing else, detailing and furnishing a kid's room is your license to get as creative and imaginative as possible. There's room in here to do things that you probably couldn't get away with as easily in the rest of your home spaces, so you ought to take the opportunity to create something fabulous, and perhaps even outlandish if the room demands it. Here, we have a brilliant kid's room that exemplifies a great balance between functionality and fun. A sturdy bed is in place below for a perfect night's sleep, while up above, a fabulously designed cubby house awaits for the waking hours: the sort of cosy haven and hiding place that your kids will absolutely love. All this talk of detailing the walls and ceiling—but what about the floors? We must forget the foundations when it comes to the kid's room: the floor has so much potential as an artful canvas as any other element or space within. Today, it's not just about the materials you use your flooring, but the range of patterns and designs available. Wall tattoos and wallpaper designs can look great, but why not consider doing the same for the floors too? Here, we see what can be done with a little ingenuity and imagination: a brilliantly-decorated floor with turn of the century map design: something fun, vibrant, unique and educational for your kids. Did you enjoy that Ideabook? 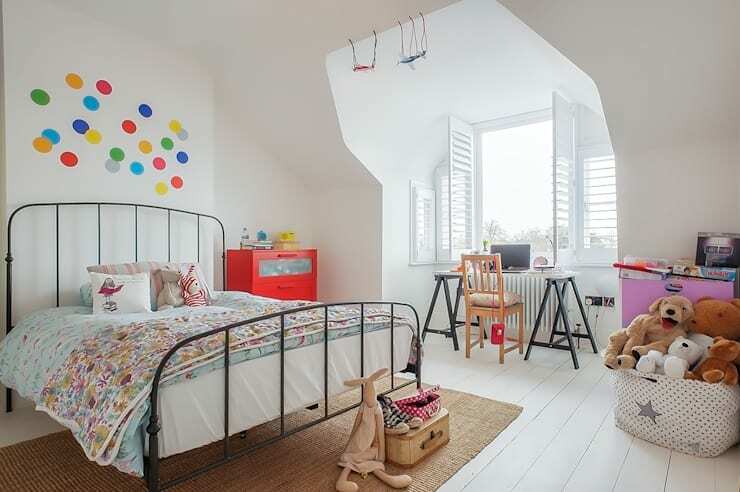 Why not keep the fresh ideas flowing with a look at Creative children's bedroom design? Do you have any other great children's room tips for our readers? We’d love to hear from you in the comments section below!